The Ruby River, in most places, is only 30 to 60 feet wide making a very wade friendly river to fish. It is surprising this small stream can be home to the quality of trout. found there. Brown trout up to 20"are tucked under over-hanging willows; at the base of riffles; or, tight to the rock- strewn banks throughout its entire length. 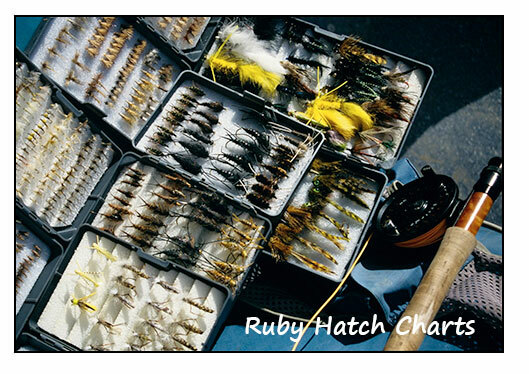 The Ruby River is a challenging fishery because of its size and tight casting. Anglers need to be aware of their back-cast because of the willows and bushes lining the bank. The rewards are well worth it. The river is considered to be one of Montana's prime grasshopper fishing rivers. Hopper fishing on the Ruby River begins earliest of any of the rivers in our area, using small green hoppers. The fishing using grasshopper patterns will continue into October. In June there are hatches of Pale Morning Duns and Little Yellow Sallies which continue till mid-August. Trico's start to appear in late July and continue through most of September and the baetis hatches will start around September 1st. Ants, beatles and other terrestrials produce good results throughout the summer season. For those anglers who like to wade small water, many will be reminded of some of their favorite streams back home. Anglers find the Ruby River to be both a beautiful and rewarding experience. If you’re thinking about taking someone fishing for the first time, try to take it easy and start small. Fly-fishing can seem complex and technical, but by choosing the right location, you can make the experience memorable and fun!